The OriginTrail Decentralized Network is as active as ever, with new nodes constantly joining and the tech community growing. The latest protocol update on the mainnet will make everyone’s node experience richer. Many users from the community have asked about the Houston app for OriginTrail node management. Houston has now been refreshed and adapted with a new release that works with the latest version of nodes on the OriginTrail Vostok Mainnet. Furthermore, we released an update, v.2.0.52, to the mainnet node today. If you are running a node on the OriginTrail Vostok Mainnet, please read the information below carefully, as you will be required to take certain steps to keep your node active on the network. Houston is your remote control for easier and user-friendly management of your OriginTrail node. First versions of Houston worked with the OriginTrail nodes on the testnet, but, with the launch of the OriginTrail Vostok Mainnet, the main focus of the core development team was on the protocol itself. From today on, Houston is compatible with the latest version of nodes running on the OriginTrail Vostok Mainnet. The new Houston v0.9.0, barring a few additional features that support the latest upgrades in the protocol, has the same look and feel as the old one. Changes mainly concern tuning the settings for data holding offers and showing the new protocol-related features like different wallets and identities of the node. You can now configure offer parameters, such as price and storage period, right from the Houston app. With the latest Houston app connected to a Data Holder node, users can see lists of their current bids, accepted jobs, and track the status of node’s replications. 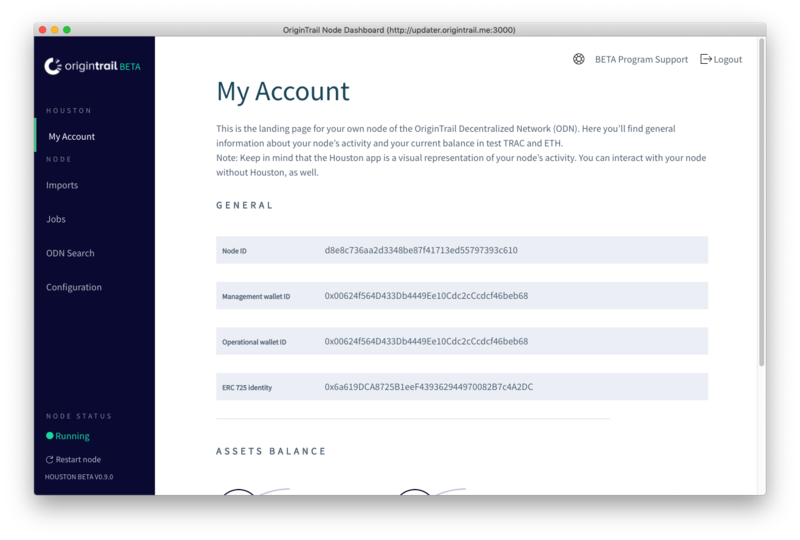 Users can also see their TRAC and ETH balances, and get information about the amount of staked and available tokens on the node’s profile. Additionally, Houston supports a secured connection between it and OT nodes. So, if you have an OT node running under a secure domain, you can try it out. You can download the Houston App from the OriginTrail website. Alongside the Houston app update, we have upgraded the OriginTrail node, as well. The new release v2.0.52 of the OriginTrail Vostok Mainnet brings many protocol tweaks, support for the latest Houston app and improved auto-updating mechanism. The new auto-update feature gives users a safer and more reliable way of transitioning to a new version. Please keep in mind that the auto-update feature is supported only for users running an OriginTrail node in a Docker container. When Should You Update Your Mainnet Node and Who Is Affected by This Release? info — Upgrading container finished. Shutting down the Docker container. After seeing this message, users should start the container by running the docker start otnode command. To discuss the latest updates with the community, visit the OriginTrail Tech Chat on Discord.